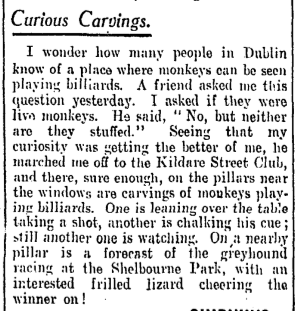 The controversy surrounding the Kildare Street Club monkeys | Come Here To Me! « Roy Of The (Sligo) Rovers. 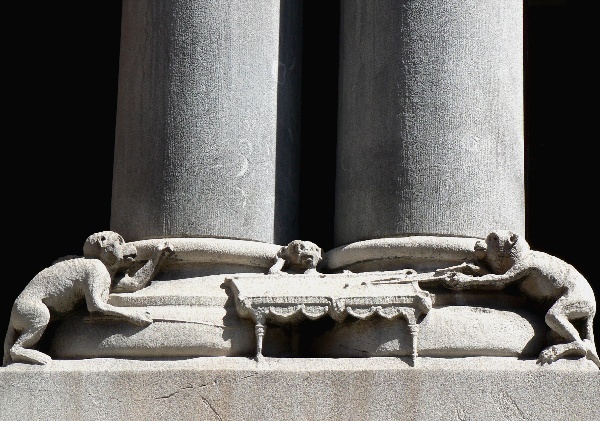 One of the most unusual and amusing architectural details in the city, in my opinion, is the stone carving of monkeys playing billiards on a window column at No. 1 Kildare Street. Now housing the the Alliance Française, the beautiful building was built for the Kildare Street Club in 1860-1 by architects Thomas Deane and Benjamin Woodward. Founded in 1782, the club was based at No. 6 Kildare Street from 1782 – 1860 and then at No. 1 Kildare Street from 1861 – 1977. A fire ripped apart its original premises on 11 November 1860 killing three maid-servants and destroying their 15,000 volume library. A superstitious person might see something in the fact on May 4 1967, a fire swept through the top floor of No. 1 Kildare Street causing extensive damage. The club merged with the Dublin University Club in 1976, thereafter sharing the premises of the latter at 17, St Stephen’s Green. However it still owns No.1 Kildare Street and currently leases the building out to a Heraldic Museum and the Alliance Française. Debate on who the actual sculptor of the monkeys was as been going on for several decades. The three main candidates being Charles W. Harrison, the O’Shea brothers and Charles W. Purdy (Purdy & Son). 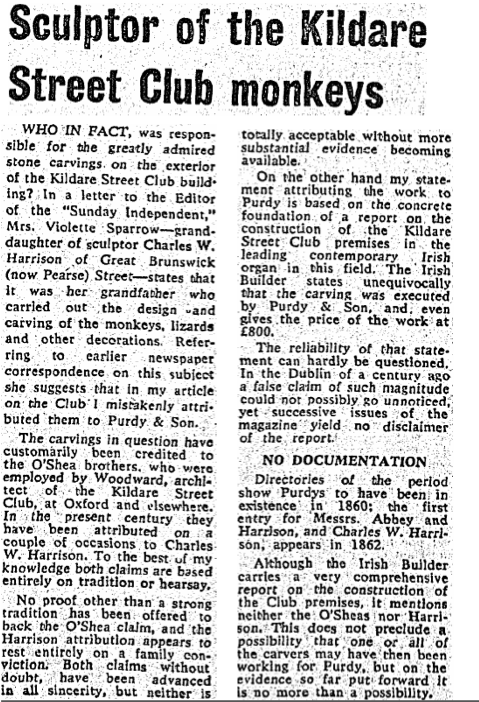 This author of this Sunday Independent article from 1969 is of the opinion that that they were the handywork of Purdey & Son. Sunday Independent. Nov 02, 1969. 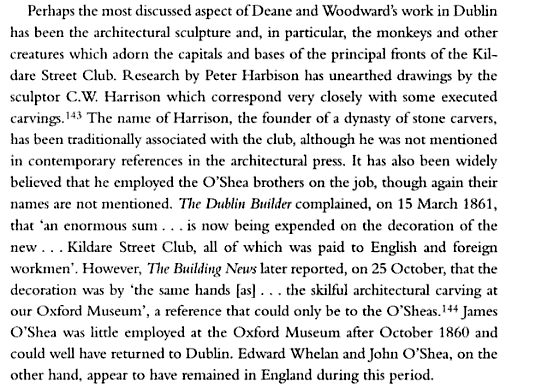 While an Irish Times article (Nov 25, 1961) alleges it was the O’Shea brothers and a piece from the Irish Press (Nov 7, 1975) states that it was Charles W. Harrison. For the record, it seems our friends over at Archiseek are on the pro O’Shea side. Frederick O’Dwyer, The Architecture of Deane and Woodward (Cork, 1997), 336. Quidung. An Irishman’s Diary. August 15, 1928. Interesting article. 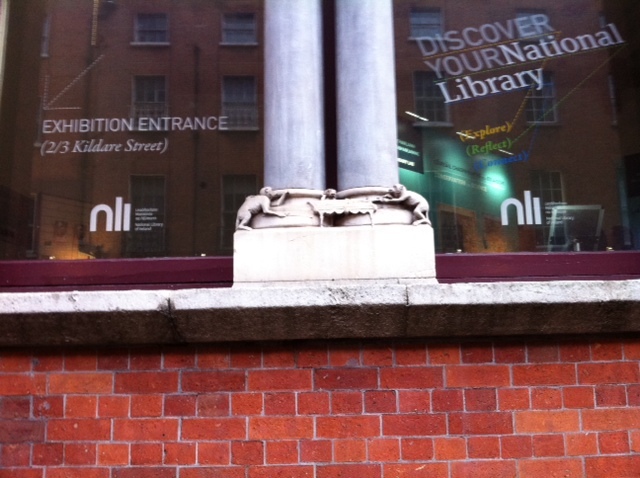 The National Library of Ireland manuscript section & exhibition room is in that building as well. More little gargoyle like carvings on higher floors too. Interesting. If you want to know more about interesting buildings and their features check out mary mulvihill’s science safaris trail in trinity college, a fascinating audio trail of trinity ‘s science heritage… Hidden well on tcd’s website! Google science safaris Tcd. on January 11, 2015 at 7:57 pm | Reply Moving Heads | Come here to me! on March 25, 2019 at 2:28 pm | Reply London and Dublin on College Green | Come Here To Me!